a natural wood interior or a drywall return, these units combine beauty with unquestioned performance. These are real windows for the roof. 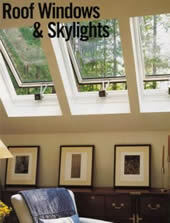 Andersen® roof windows and skylights are full of overhead options. Whether the choice is venting or non-venting, a natural wood interior or a drywall return, these units combine beauty with unquestioned performance. These are real windows for the roof.